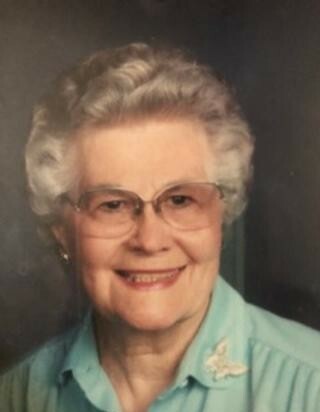 Martha Adams, 97, of Laurinburg, gained her Heavenly wings on the morning of November 26, 2018, after an illness. She was born to the late William Benjamin Burroughs and Sallie Burroughs on March 6, 1921. A memorial service will be held at Scotia Village on Tuesday, December 4, 2018 at 11:00 am. Martha was very involved in her community and spent hours of selfless dedication to organizations she held dear. She served as president, vice president and treasurer of the Extension Home Economists; was a member of the First United Methodist Church in Rockingham, where she was involved with the Woman’s Society of Christian Service and a circle leader, and served as president and vice president of her ladies Bible class. She was also the regional treasurer of the N.C. Home Economics Association; served on the nominating committee of the Rockingham Woman’s Civic Club; was a member of the American N.C. Home Economics Association; was a member of Epsilon Sigma Phi; secretary of the Richmond County Investment Club; a member of the N.C. Farm Bureau; and countless other organizations. Martha was also a breast cancer survivor and a board member of the Richmond County Cancer Society. Not only was Martha an active and dedicated community member, but she was a dedicated mother, grandmother, wife, sister, daughter and friend. She felt it was important to always put God first, family second and everything else third. She was kind, witty and smart and made the best ambrosia in the world. Martha loved to travel and live life to the fullest, having traveled to 48 states and several countries throughout her lifetime. Martha cared about the people in her community and championed for many causes such as cancer, multiple sclerosis and handicapped children. She was also an American Red Cross Volunteer. Martha spent much of her life living at the Scotia Village Retirement Community, having moved there shortly after her husband passed away. She cherished her time there and made friends with the staff, caregivers and fellow inhabitants. They were a great source of comfort and companionship during her time there, and for this her family is eternally grateful. Martha is predeceased by her husband, Malcolm Louie Adams Sr.; her sisters, Margaret Provo and JoAnn Campbell; and many family members and friends who we know joyously accepted her as she crossed through the gates of Heaven. Martha leaves behind her sons, Malcolm Louie Adams Jr. (Judith) of Little River, SC, and William Frank Adams (Kimberly) of Rockingham; and grandchildren, Chase Mitchell (Elizabeth) of Charlotte, Austin Adams, Carsen Adams and Conner Adams of Rockingham and Wendi Lee (Justin) of Myrtle Beach, SC.. She also leaves behind a great-grandchild, River Lee, of Myrtle Beach; and many friends and caregivers at Scotia Village and Scotland Hospice, who will all miss her dearly. In lieu of flowers, please send memorials to Scotia Village Retirement Community, 2200 Elm Avenue, Laurinburg, NC 28352 or Scotland Regional Hospice, P.O. Box 1033, Laurinburg, NC 28353.